Model 006 of the Dojo Pro is a nod to the 'Hagakure' - the book of falling leaves, one of the greatest pieces of literature detailing the life and death of the Samurai Warrior, whose transitory existance is likened to the leaves of a tree, the same kind of leaves depicted in this swords distinctive solid iron tsuba – an exact copy of an actual edo era antique. 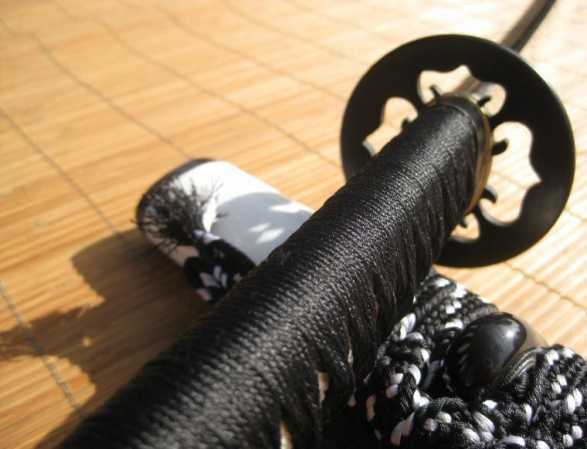 Like all the fittings of these swords, the tsuba is solid iron – but so is the fuchi (band at the top of the handle) AND the kashira (end cap) – all acting in harmony to strongly reinforce the structural integrity of the entire handle in a way that is almost never seen on other swords under the $500 price point (nevermind on swords under $300!). 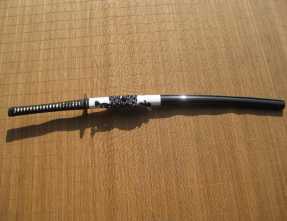 The tsuka/handle assembly itself is exceptionally tight and well put together, double pegged with black silk ito wrapped over REAL rayskin, wrapped around a quality wooden core in the traditional alternating style to ensure it remains tight despite frequent usage. Furthermore, as you can clearly see from the picture above, the handle is also properly ergonomically ‘shaped’ to follow the curve of the blade AND fit comfortably into the hand, creating a safe and firm grip - another rarity at this price point. The saya (sheath) itself thick and made from quality wood - lacquered black and transitioning to white towards the koiguchi, which - along with the Kurikata and Kojiri, are made of hand cut and polished buffalo horn, finished off with a hard wearing length of interlaced black and white sageo (cord) so it can be secured to your obi (belt). The strength of the fittings ALONE are head and shoulders above any other sword maker anywhere near this price point, but the 28” blade takes it to a whole new level again.. These 1060, through tempered, no-nonsense monosteel blades are exceptionally HONEST and RELIABLE. I had been shopping for a katana for quite some time for use in tameshigiri. My Shinkendo sensei recommended that I look over the SBG website for a good look at some choices for my first. After looking at the info and reviews, I finally settled on this beauty. I read that it was built tough and chose this particular style because I liked the 2 color saya. Shipping was quick and it arrived in perfect condition. This sword is everything promised and more! Razor sharp and made for actual use, everything is built tight and durable. 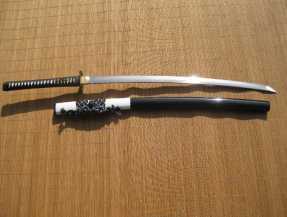 The ito and mekugi are tight and the sword fits in the saya snugly. I was in love. My sensei looked it over and was amazed at the price for such quality. I haven't began my tameshigiri yet, but I have no doubts that it will easily handle the training.